South Africa's unique history has produced literatures in many languages, in both oral and written forms, reflecting the diversity in the cultural histories and experiences of its people. The Cambridge History offers a comprehensive, multi-authored history of South African literature in all eleven official languages (and more minor ones) of the country, produced by a team of over forty international experts, including contributors from all of the major regions and language groups of South Africa. It will provide a complete portrait of South Africa's literary production, organised as a chronological history from the oral traditions existing before colonial settlement, to the post-apartheid revision of the past. 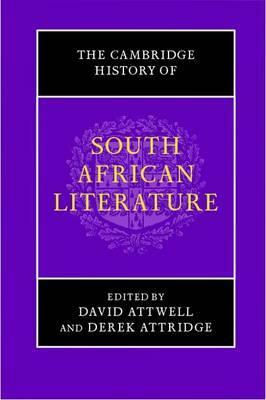 In a field marked by controversy, this volume is more fully representative than any existing account of South Africa's literary history. It will make a unique contribution to Commonwealth, international and postcolonial studies and serve as a definitive reference work for decades to come. Introduction David Attwell and Derek Attridge; Part I. Oratures, Oral Histories, Origins: 1. 'The Bushmen's Letters': |Xam narratives of the Bleek and Lloyd Collection and their afterlives Hedley Twidle; 2. A contextual analysis of Xhosa iimbongi and their izibongo Russell H. Kaschula; 3. I sing of the woes of my travels: the lifela of Lesotho Nhlanhla Maake; 4. Praise, politics, performance: from Zulu izibongo to the Zionists Mbongiseni Buthelezi; 5. IsiNdebele, siSwati, Northern Sotho, Tshivenda and Xitsonga oral culture Manie Groenewald and Mokgale Makgopa; Part II. Exploration, Early Modernity and Enlightenment at the Cape, 1488-1820: 6. Shades of Adamastor: the legacy of The Lusiads Malvern van Wyk Smith; 7. In the archive: records of the Dutch settlement and the contemporary novel Carli Coetzee; 8. Eighteenth-century natural history, travel writing and South African literary historiography Ian Glenn; Part III. Empire, Resistance and National Beginnings, 1820-1910: 9. Writing settlement and empire: the Cape after 1820 Matthew Shum; 10. The mission presses and the rise of black journalism Catherine Woeber; 11. The imperial romance Laura Chrisman; 12. Perspectives on the South African War Elleke Boehmer; 13. The beginnings of Afrikaans literature H. P. van Coller; Part IV. Modernism and Trans-National Culture, 1910-1948: 14. Black writers and the historical novel: 1907-1948 Bhekizizwe Peterson; 15. The Dertigers and the plaasroman: two brief perspectives on Afrikaans literature Gerrit Olivier; 16. New African modernity and the New African movement Ntongela Masilela; 17. Refracted modernisms: Roy Campbell, Herbert Dhlomo, N. P. van Wyk Louw Tony Voss; 18. The metropolitan and local: Douglas Blackburn, Pauline Smith, William Plomer and Herman Charles Bosman Craig MacKenzie; Part V. Apartheid and Its Aftermath, 1948-the Present: 19. The Fabulous Fifties: short fiction in English Dorothy Driver; 20. Writing in exile Tlhalo Raditlhalo; 21. Afrikaans literature 1948-1976 Hein Willemse; 22. Afrikaans literature after 1976: resistances and repositionings Louise Viljoen; 23. The liberal tradition in fiction Peter Blair; 24. Black Consciousness poetry: writing against apartheid Thengani H. Ngwenya; 25. Popular forms and the United Democratic Front Peter Horn; 26. Writing the prison Daniel Roux; 27. Theatre: regulation, resistance and recovery Loren Kruger; 28. The lyric poem during and after apartheid Dirk Klopper; 29. Writing and publication in African languages since 1948 Christiaan Swanepoel; 30. Writing the interregnum: literature and the demise of apartheid Stephen Clingman; 31. Rewriting the nation Rita Barnard; 32. Writing the city after apartheid Michael Titlestad; Part VI. South African Literature: Continuities and Contrasts: 33. South Africa in the global imaginary Andrew van der Vlies; 34. Confession and autobiography M. J. Daymond and Andries Visagie; 35. 'A change of tongue': questions of translation Leon de Kock; 36. Writing women Meg Samuelson; 37. The 'experimental line' in fiction Michael Green; 38. The book in South Africa Peter D. McDonald; 39. Literary and cultural criticism in South Africa David Johnson; Index. David Attwell is Professor of English at the University of York. Derek Attridge is Professor of English at the University of York.